A few years ago, I was invited to Bruce and Kim's for a caroling party on the night before Christmas Eve. It was so much fun! We all brought flashlights and bundled ourselves up, then strolled around town singing our hearts out for the whole neighborhood. We had a blast! 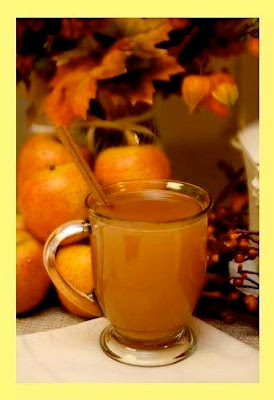 Anyway, after we finished singing, we all went back to the house for a warming mug of spiced apple cider. It was the perfect thing! So, when you have YOUR caroling party, be sure to make this for your impromptu choir. It's warm and comforting and it makes the whole house smell wonderful! Heat apple cider. Add all ingredients. Allow the mixture to simmer for half hour or more. That's all there is to it! Serve in mugs. To keep everything warm, place spiced cider in a crock pot set on the warm setting. Place a ladle nearby so guests can serve themselves! Bruce and I were just talking about that party the other day and how much fun it was. We might just have to bring it back.